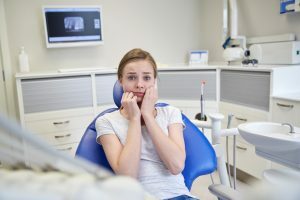 Does going to the dentist cause knots of anxiety in your stomach? How about just thinking about a dental appointment? Unfortunately, this is the reality for many people, and dental fear keeps a lot of folks away from the dentist and much needed care for their teeth. Dr. Drew Vanderbrook wants you to know there are solutions to help you get the dentistry you deserve, and also help you feel at ease during your treatment. Your dentist in Lakewood Dallas discusses your options for dental sedation. It’s important to know that you’re not alone when it comes to dental fear or anxiety. It’s estimated that 20% of American adults fear going to the dentist. Whether you had a bad childhood experience, fear pain, or you feel embarrassed about the state of your teeth, Dr. Vanderbrook and his team want you to know we’re here to help you! Our friendly team always has your comfort in mind, and the state-of-the-art equipment in our office helps make many dental procedures more comfortable and effective. If a welcoming atmosphere and a gentle dentist are not enough to ease your mind, Dr. Vanderbrook offers oral sedation for his fearful patients. Oral sedation consists of a pill that is taken one hour prior to your appointment and is prescribed just for you by Dr. Vanderbrook, based on your specific needs. While you’ll still be conscious and responsive, the medication will help you feel completely relaxed. In fact, many patients report that they felt as if they were sleeping throughout their appointment. The medication also has an amnesic effect, which means that you probably won’t remember what went on during your procedure. Because of the nature of the medication, you’ll need to arrange transportation to and from your appointment, as you won’t be able to drive yourself home. You’ll also want to have someone stay with you for the first few hours after your procedure while the medication is leaving your system. Plan on relaxing for the rest of the day, and resuming your normal activities the following day. Dr. Vanderbrook will choose the right medication for your needs and you can rest assured that oral sedation is safe and effective. It can also be an excellent option for patients who need multiple procedures done during one appointment. Are you ready to conquer your dental fears? Give your sedation dentist in Lakewood Dallas a call today to learn more about oral sedation.